I generally don't get too exited over software, or anything having to do with computers. Computers are a necessary evil in my little world; a source of constant aggravation, due almost entirely to my lack of computer skills. I would much rather spend my time shooting or tuning a new gun, or loading ammo for an old favorite. Most things having to do with computers are, to me, exceedingly boring. I use the beast to write my articles, then send the article and photos to my brother, Boge, and he does the magic to get them to appear on our website. I have no idea how, but he does it. All this is to explain how underwhelmed I was when I received this particular CD-ROM in the mail. After setting it aside for a few days, I looked more carefully at the package. The title "Guntracker" piqued my interest, so I decided to see if I could figure out how to make it run without calling on Boge to help me. What I discovered after playing with the program for about a minute was that this thing could be useful! 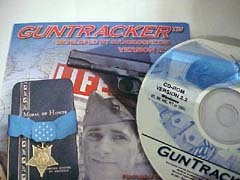 The Guntracker program contains the complete "Blue Book of Gun Values" by S.P. Fjestad. 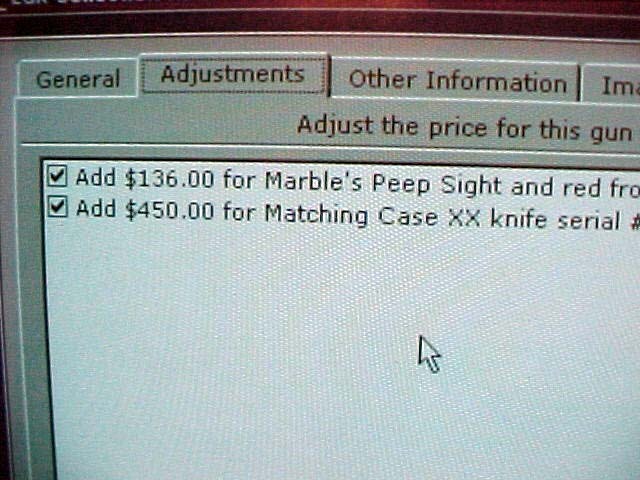 This information is the best and most quoted gun pricing guide available. Published and updated yearly, the Blue Book is usually pretty accurate in keeping up with gun values. While sometimes regional prices will vary from the data in the book, it is a valuable tool in assessing the gun market on a nation-wide basis. The main purpose of the Guntracker program is, however, easily keeping track of a shooter's or collector's gun inventory. 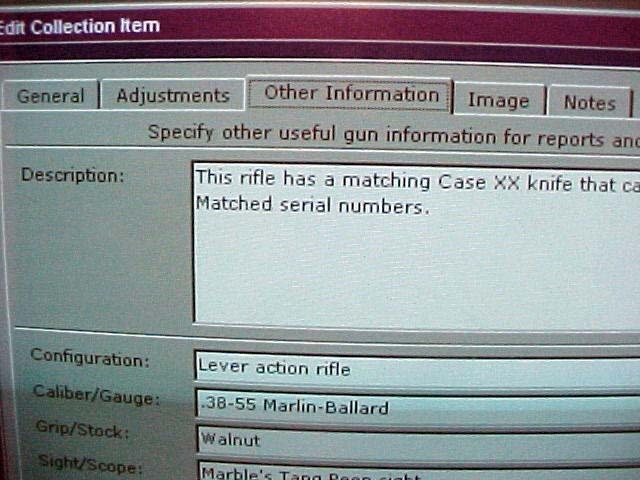 I have always tried, with limited success, to keep track of my ever-changing stock of guns by writing down serial numbers on paper and storing the paper in a drawer somewhere. The problem with that system is that it ain't much of a system, and does not stay up-to-date on inventory or value. I have often thought that in case of a loss, either by fire or theft, I just don't have all the information needed to even start to file an insurance claim. Also, if I up and die, my wife has no idea of the value of my guns, or even what they are. She has no clue that an old Ruger sixgun is worth much more than a bright, shining new one. Her new boyfriend might trade off my Dave Clements Custom .44 Special for something worthless, like a computer. After messing around with the Guntracker program awhile, I discovered the really unique feature that makes this program more valuable than just a list of guns. The Guntracker has a feature that allows you to download an updated version yearly, that will make changes automatically to the listed gun values in your inventory. 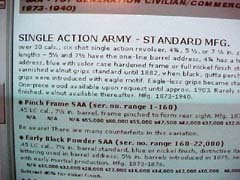 You can, however, override this feature on any or all guns listed if you so choose, and just obtain the updated Blue Book. The download feature can save lots of time in constantly updating your gun values as inflation and collector interest changes the values on some firearms dramatically. Another feature of the Guntracker that is really nice is the ability to easily adjust the value of a firearm in your collection by listing special features such as scope sights or valuable custom work. 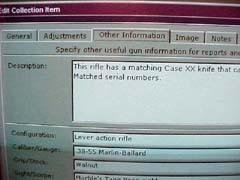 There is a screen for just this purpose each time you enter a firearm into the database. 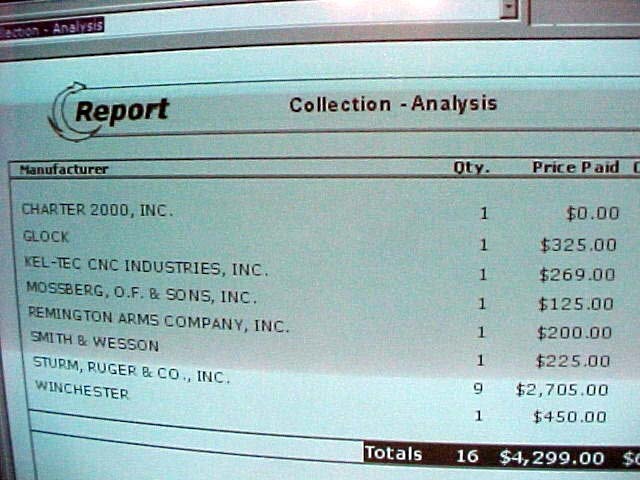 The Guntracker keeps track of details such as serial number, price paid, current value, special features, barrel length, caliber, etc. 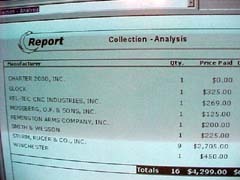 All information can be accessed individually, by manufacturer, gun type, or all together in printable summaries of the entire collection. The information is easily entered, even for someone with limited computer knowledge. It took me about two minutes per gun, including entering a photo, to completely list my collection. 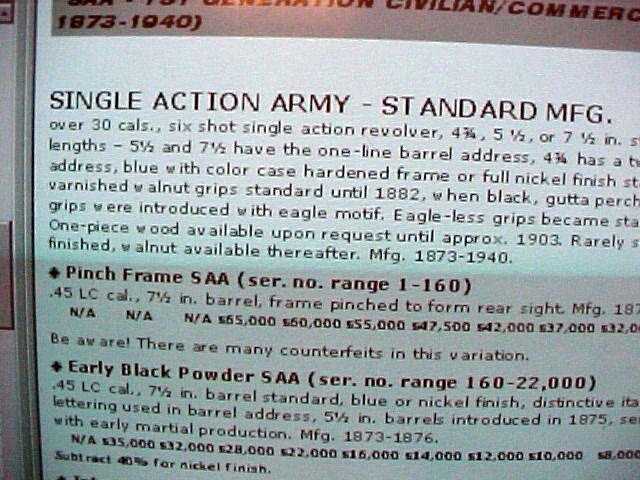 The photo feature is very important in the event that someone besides yourself must identify your guns. 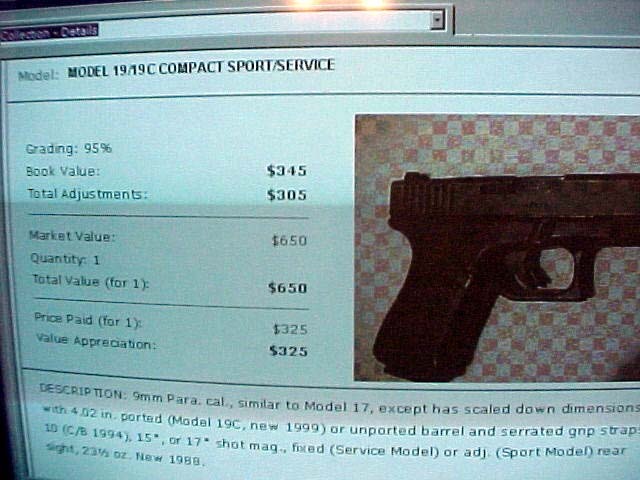 It is easy to place a clear digital photo along with the other data on each firearm. The entire database, including photos, can be downloaded to a disk or printed on paper to be stored in a safe or bank lockbox, and the process is amazingly simple. 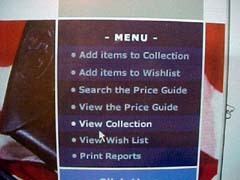 Click on a couple of screens and hit the print button; it's that easy. After using Guntracker for just a couple of days, I can say that this could be one of the most important and valuable tools for any gun owner. This is just the program that I have needed for years to keep track of a constantly changing rack of firearms. Even for someone with just a couple of guns, the information stored on the Guntracker program could mean a great difference to you in the event of a loss, and prove to be an invaluable aid to your heirs in the inevitable event of your death. Do you really want your brother-in-law determining the value of your guns after you're gone? How about your old buddy down the road, or the "helpful" guy at the gun shop? I didn't think so. 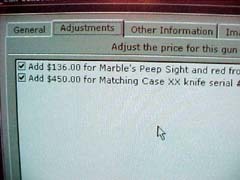 For the price of only $34.95, you can save yourself or your family many times that amount by keeping an accurate inventory and value on your guns. You can find out more about Guntracker on their website: www.guntracker.com [Ed. Note: As of September 2016, Guntracker is out of business, the link is now defunct.]. If you own guns, even just a couple of guns, I suggest strongly that you get Guntracker today. After trying it out, I won't ever be without it. 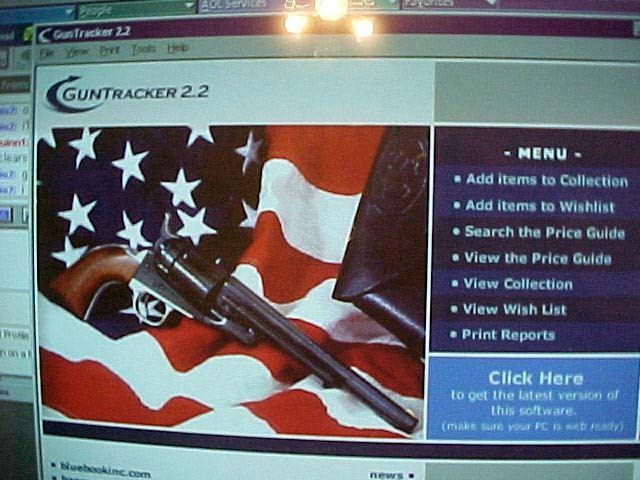 Guntracker CD-ROM software is an easy and inexpensive way for shooters and collectors to track the value of their firearms. Opening screen incorporates the main men\u, an intuitive and simple "point-and-click" interface that even the author can navigate! Guntracker incorporates S.P. Fjestad's "Blue Book of Gun Values", the single most respected publication relating to gun values. 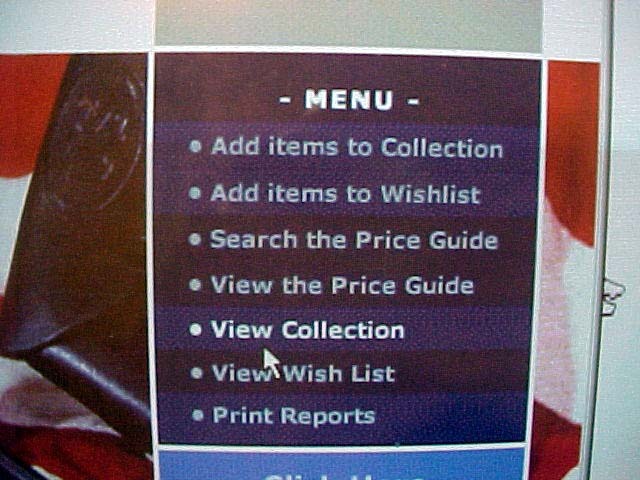 Information can be automatically updated as desired so that all values remain current. Simple data fields allow for calculating the value of custom configurations and aftermarket alterations. Check boxes add values for scopes, etc. 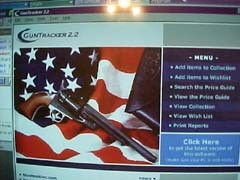 Guntracker produces easily-printable summaries that can be stored in a safe location in data form or in printed form. The author, who sees computers as the most fiendish instruments of torture ever devised to bedevil the days of man, believes this software is something that no gun owner should be without. It is easy to use, inexpensive, and invaluable in case of death, theft or natural disaster. Highly recommended.